"This could be the last thing we do in life." They're the words of an Islamic State commander to a group of European men in rare, raw footage obtained by ITV News. The video was filmed in 2013, notably before the caliphate was declared and at a point when Isis recruitment was on the rise. Many questions arose from the footage: where was it filmed, who is the man speaking and who are the crowd listening? Plus - most curiously - why is a British ambulance at the scene? An ITV News investigation answered them all. Firstly, what is said in the video? The commander, who ITV News would come to identify, sets up the plan to build a new "Dawlat al-Islam" - an Islamic State in Syria. "We know the place, have times, have Shilkas [an anti-aircraft weapon], have bullets, have weapons, like no other place," he tells the group in English as he is filmed from a nearby window at the property. "This is a perfect place, a perfect spot to hit to build a new Dawlat al-Islam (Islamic State)." Why does his message matter? For the timing and the tactics. In 2013, it's a clear call-to-arms for the Europeans to play a key role in the soon-to-be established caliphate. "Daesh, they couldn’t attack," the leader tells them. "So the Emir of Dawlat al Islam said 'we might take out the Turkish group and take in the European group'." The words are unmistakable. But with only the footage to go on, many questions remained. We were confident the group were in the Syrian city of Aleppo but had no idea of the property. Tracking down the exact location meant following the on-screen clues. We compared a domed building in the distance and other structures to satellite images from 2013. Then we scanned the network of dusty roads for a property with a view of the buildings and which had a fountain in the courtyard. Soon, a clear location emerged. So we are sure the filming took place at a suburban villa in a small town called Hraytan. But it was another thing on screen that drew our keenest attention: the British ambulance beyond the walls. What identified it as British? 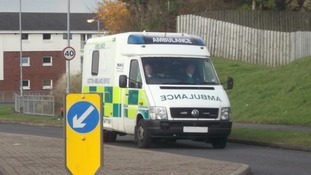 There was no number plate visible on the vehicle, but a closer look at the peeled signage on high-resolution images showed it had originally read: Scottish Ambulance Service. A search for footage of ambulances in Syria at the time, which were used in aid convoys, delivered a match to one vehicle. Its signage was peeled in exactly the same places. And that footage gave us a number plate to trace. The decommissioned ambulance was part of a legitimate aid convoy and had been bought earlier in the year in an auction. It was reported to have arrived in Syria the week before our obtained video was filmed. Using the registration, we also found an image of it still in operation in the streets of East Kilbride 10 months earlier. The Scottish Ambulance Service confirmed to ITV News: "This A&E Ambulance, which spent most of its operational life in the Wishaw area, was owned by The Scottish Ambulance Service until decommissioned in 2013 when it was sold through public auction." Are all the men in the video militants? It's clear the speaker giving the tactical instructions is a militant leader. He's a Swede, Hassan al-Mandlawi, who left Syria to return home to Gothenburg. Al-Mandlawi was later arrested and then jailed for taking part in an execution video. A second man was easy to identify. He's another Swedish militant, known as Abu Bakr, which drew our investigation's first clear link to Britain. Abu Bakr and Khadijah Dare's young son later appeared in an Isis propaganda video. Bakr had married a British woman, Khadijah Dare, from London. Formerly known as Grace, her connection to Isis is well known; her mother even publicly appealed for her to return home on a programme called Jihadi Brides. Bakr and Dare's son would also later feature in an Isis video. Is Bakr's family the only British link to this video? We didn't think so. There appeared to be other pointers in the footage too. The young girl, who becomes bored, seeks out her father with a call of "daddy" in what appears to be an English accent. But we had our suspicions confirmed having already found one of the other men in the footage. We tracked him down to his homeland in Finland. After returning home from Syria, terrorism offences against him were dropped. He agreed to talk to us but wanted to remain anonymous. So we travelled to Helsinki and met him. He remembers the day that footage was filmed - but claims not all the listeners in front of the fountain were militants. Some of the people are aid workers, who like him - he says - were there for humanitarian purposes. And, yes, he remembers the Scottish ambulance. "(It) was brought by British aid workers," he says. "At some point they gave me that ambulance... and (we) went to refugee camps." The Finn also confirmed the presence of British-based fighters in the video straight away. How did he know them? Because, it turns out, he used to be a student in Manchester so it was easy for him to spot the Brits. He says he became interested in the suffering of Syrians during his Bachelors degree course. He remembers his local mosque talking a lot about what was happening in Syria during Friday sermons. So who did he identify as British based? He named the father of the young girl in the footage as Ibn Ajam and said he was from the UK, but we couldn't find out more about him. But he notably named another as Abu Yaqoob, describing him as one of the "first foreign fighters". Speaking of Yaqoob, he says: "I didn’t like his personality and his attitude." He remembers him being "aggressive" and humiliating locals in Syria. And, he says, Yaqoob was the connection to more recruitment from Britain. "Later on, some of his friends came from England," he said. We believe Abu Yaqoob is Nero Saraiva, who we identified from images taken before he left for Syria. Angolan-born Saraiva moved to London from Lisbon with his family and is a known close friend to the four British executioners commonly known as 'The Beatles'. On Twitter he even previewed one of their infamous beheading videos. Saraiva left east London six years ago. It's not clear whether he’s still alive, but some family members have said, if he is, they fear he might return to Britain. Saraiva's fate remains one of the questions still without an answer. He and others who appear in the footage would clearly go on to follow their leader's words into action. Yet it came at a time of blurred interests and roles of foreigners within the country, from delivering aid, supporting the uprising or joining the IS cause. Not all those listening can be identified as recruited violent extremists. But our investigation into the grainy call-to-arms filmed in Syria five years ago has brought one thing into sharper focus. It's more visual proof of the wide international spread and early British connections to Islamic State's era-defining hate call to arms. And why does it still matter what was happening in 2013? Because, with Islamic State now in retreat, those who managed to survive are potentially now heading back to - or already living in - Britain.